Jurassic World: Fallen Kingdom is the sequel to 2015’s Jurassic World and is directed by J.A. Bayona, taking over from Colin Trevorrow who is still on board as a writer and executive producer. 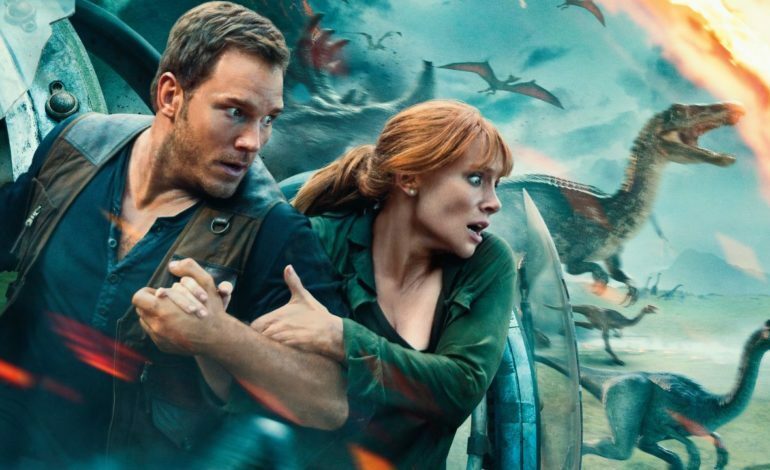 The movie once again follows Claire Dearing (Bryce Dallas Howard) and Owen Brady (Chris Pratt) as they return to Isla Nublar in order to help a wealthy businessman named Eli Mills (Rafe Spall) rescue the remaining dinosaurs before a volcanic eruption destroys the island and everything on it. Now, that is the basic plot synopsis for this movie; however, I will talk minor plot points that were revealed in the trailers, so if there are any readers who would rather go into Fallen Kingdom not knowing anything about it in advance, then I would recommend skipping this review until afterward. Love and admiration for the original Jurassic Park aside, I wasn’t exactly the biggest fan of Jurassic World and therefore didn’t go into the sequel with the highest of expectations. In fact, I almost wanted to hate this movie enough to make me go back and re-watch Jurassic Park but it actually ended up making me like Jurassic World even less because Fallen Kingdom is a fun time at the theater for those who are wanting one. Much of my appreciation for the movie comes down to its technical qualities, which unsurprisingly come down to the new director involved. First of all, the cinematography and sound design are both superb, which is why I am glad that my screening was in IMAX since both elements are significantly elevated in this format. Nevertheless, I cannot stress enough how great of a director J.A. 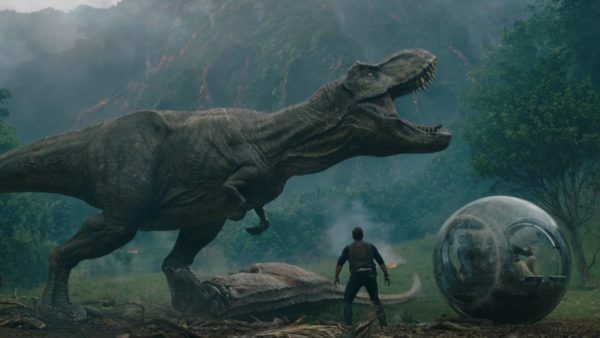 Bayona is since he puts a clear focus on visual language more than anything else, as he often uses lighting and character placement to elevate the tension and scope of these scenes, making the movie feel more akin to Jurassic Park than the first Jurassic World; furthermore, Bayona’s direction is so incredible that I honestly would’ve preferred if he directed the first Jurassic World instead of Trevorrow, who is unfortunately returning to direct Jurassic World 3. The music for Fallen Kingdom also pleasantly surprised me. Michael Giacchino, fresh off composing the soundtrack for last week’s Incredibles 2, delivers another great musical score, which is not quite as great as that one, but still a cut above most generic blockbuster stock music, creating some memorable compositions without feeling too derivative. My one major gripe with the technical aspects of Fallen Kingdom is that the CGI hasn’t improved all that much since Jurassic World. The dinosaur animation works for the most part, even when the movie puts them into crazy and unrealistic feats but there were still times where I could see through the illusion, mostly when the dinosaurs were in broad daylight or when the camera was too close on their face. I’m still shocked that the original Jurassic Park had better looking dinosaurs twenty-five years ago. Another area that Fallen Kingdom improves over its predecessor is in the characters, but that still isn’t saying much. What surprised me the most on this front is how much I liked Claire more this time around. In the first movie, she was an annoying business woman who cared more about keeping the park safe than making sure her nephews were okay, and I didn’t feel her character went through any significant changes. Fortunately, she is way more interesting in Fallen Kingdom, and Howard delivers during the more emotional moments as well. Owen, on the other hand, is relegated to the comic relief sidekick this time around, which didn’t bother me all that much since he still serves a purpose in the story and Pratt’s sheer likeability can only go so far. Everyone else in the movie doesn’t do much outside of portraying their archetypes – specifically, these two employees at Claire’s dinosaur rights activism foundation (can’t believe I just typed that), played by Justice Smith and Daniella Pineda, who are not all that important in retrospect and are rather annoying. Rafe Spall is also barely serviceable in this corporate businessman villain role that has already been done in so many other movies. Oh and for anyone excited to see Jeff Goldblum back in another Jurassic Park movie after so many years, he is barely in the movie. The screenplay is a bit of a mixed bag. One my biggest issues with Jurassic World was that it had a major identity crisis. At times it wanted to be another Jurassic Park movie, and others a generic summer blockbuster. Thankfully, Fallen Kingdom makes the smart choice not to pander to the nostalgia of the original and instead forge its own path. The movie is laden with genre tropes and logical inconsistencies, but they don’t bother me as much since this movie doesn’t take itself as seriously as its predecessor. Unfortunately, the story is rather predictable, especially for people who saw the trailers. Even so, I still was thoroughly entertained by the action scenes that I’ve already seen excerpts from in the trailer. Jurassic World: Fallen Kingdom is similar to Alien: Resurrection in that it’s dumb, it’s illogical, it barely resembles the original, but I would be lying if I didn’t say that I had a good time. I probably enjoyed this movie more than I should, since I went in with low expectations, but would still recommend it to those who are wanting a fun time at the theater. Otherwise, just see Incredibles 2 again.